MSI have delivered a big screen laptop, but does it offer big performance? The MSI VR705-045UK (£549 inc. VAT) is one of the larger laptops around and its dedicated graphics card makes it an ideal desktop replacement system. The 17-inch screen has a resolution of 1440 x 900-pixel resolution provides lots of space to work with multiple windows. It lacks the vivid colour reproduction found some other screens, but is still a great panel for watching movies on. Multimedia use is reasonable, with an entry-level Nvidia GeForce 8200M G GPU that offers better 3D capabilities than Intel-based rivals. 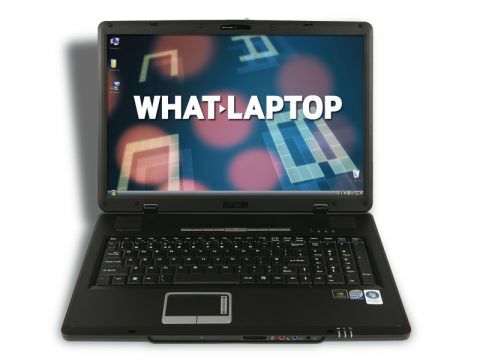 Capable of running older games, it also copes fine with office tasks and movie playback, although more modern and demanding games are still the reserve of more expensive laptops. The large chassis allows for a numeric keypad to be fitted alongside the main keyboard, but some of the keys have been made smaller to accommodate it. As such, typing mistakes are a common occurrence when typing at speed. The board also flexes under pressure, with a spongy typing action, and it feels a lot cheaper than machines such as the excellent Lenovo ThinkPad SL500. While the plastics on this machine are tough enough to withstand regular use, as with the keyboard, they lack the sturdy feel of rivals such as the Lenovo. With a black finish throughout, it's also a sombre machine, lacking in style. There's plenty of performance on offer, however, thanks to a mid-range 2GHz Intel Core 2 Duo processor and 4096MB of memory. We found it a quick machine in daily use and lag was only apparent when running a host of intensive applications simultaneously. Battery life proved disappointing, running for just 142 minutes between charges, although this is less likely to be an issue on a machine of this size. A comprehensive set of features include a 320GB hard drive and a tri-format DVD rewriter, letting you back up files to all current formats of blank DVDs and CDs. 802.11n Wi-Fi and Gigabit Ethernet networking adapters make it easy to connect to home and office networks, and also to the internet. Three USB ports and an ExpressCard reader offer good connectivity for all your peripherals. There's also a flash memory card reader for easy access to photographs taken on most digital cameras. Bluetooth offers wireless connectivity with other digital devices. With impressive performance and a large screen, the MSI is worth a look if you don't mind sacrificing style or quality. It's not perfect, however, and is worth trying before you buy.